It's our best plug-in energizer for fences in high resistance conditions. Even on lower-resistance fences, the joules it delivered to the end of the fence were often double that provided by other 5-joule units. The 506 is excellent for repelling hard-to-stop deer herds that are "addicted" to vegetables, trees and shrubs in commercial fruit and vegetable acres. 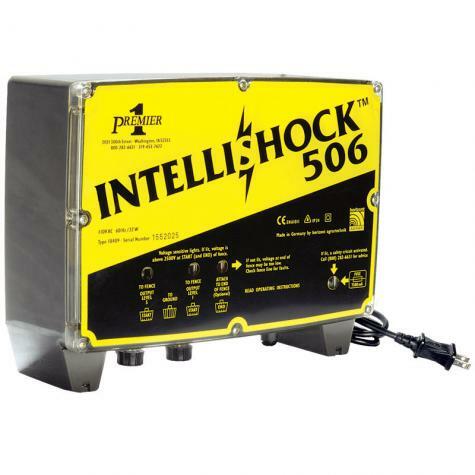 In our field tests, no plug-in unit (not even some with 30 stored joules) matched the 506 for energizing fences that had high circuit resistances (dry/snow/rocky/sandy soils and animals with high internal resistances such as deer, goats and rabbits). 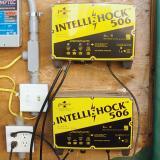 A very powerful 110v electric fence energizer used to keep in cattle, sheep, goats, horses, poultry and guard dogs. Effective at protecting against coyotes, stray dogs, bear and fox as well. It also works to keep out deer, raccoons and rabbits from garden/orchard areas. Requires at least 8-15 feet of ground rod in the ground. Draws 22 watts per hour. Features an output level 1 terminal for low resistance fences and a level 5 output terminal for high resistance fences. Features an 'end fence' terminal that allows you to check the voltage at the end of the fence line. 19,500' of weed laden fence. True wide-impedance output curve. Wide-impedance units perform better over a wider range of fence conditions and conductors than standard low-impedance units. Areas where wide-impedance units excel are: high resistance conductors (stainless steel polywire/hot tape/electrified netting); minimal ground rods; livestock or wildlife with dry skin or hair (poultry, deer, goats); and very dry soils. Safe to use with all polywires, polyropes, tapes and electrified nets. The IntelliShock 506 can be mounted either inside or outside of a building, but not where there is risk of fire. The energizer must be mounted vertically. Protect the energizer from direct rainfall. For the End terminal/Fence Interruption: If the beginning of the fence is connected to terminal START (output level 5) and the end is connected to terminal END this control light flashes with the pulses in case of no fence interruption (no shorts). There is no flashing if the fence line is interrupted (has a short). If the beginning of the fence is connected to terminal START (output level 1) its control lamp is not illuminated with weed load on the fence and the control lamp (END) remains dark with fence interruption. This is, by far, the best charger I have ever used (and boy, have I used a bunch of them!) The wide impedence is an answer to prayer, as we fight dual problems of lots of weeds and rock hard ground that is often bone dry. (I don't know how we got blessed with both drought and weeds, but we've got it!). We energize approximately 20 miles of aluminum medium-tensile wire, plus somewhere around 20 of Premier's electrified netting rolls, and it is a sad day when we accidentally touch the fence. The warning to keep children and visitors away is quite appropriate. You absolutely cannot spend money better on an energizer, if you need one for a lot of fence. I will never buy any other charger again. Thank you, Premier and horizont for solving all my electric fencing woes!